ART OF TRANSIT: A bus operator, from our Instagram feed. Four planning experts share their thoughts on the massive development planned for the south side of Grand Avenue, opposite Disney Hall. There seems to be some agreement that current plans are not exactly super awesome and James Rojas even compares it to Nicolae Ceaușescu’s Palace of the Parliament. This is not a compliment. Note to Source readers: This marks Nicolae Ceausescu’s first appearance on the Source. Last week, hemorroids made their Source debut. We are breaking new ground every week. Excellent maps showing how House and Senate members voted on the bill to reopen the government that people like you and me pay for each and every day. Of course, the ‘yes’ votes won in the House, but there were still 144 ‘no’ votes and to my eye, the square mileage of those House districts appears to outnumber the ‘yes’ votes. In other words, a lot of rural areas voted ‘no’ even if they get all sorts of federal subsidies for things like farming, forestry, grazing, etc. BART workers are still on the job today as negotiations continue with workers for a new contract. Meanwhile, Gov. Jerry Brown imposed a seven-day cooling off period on AC Transit in order to keep buses rolling in the East Bay. Unrelated thought: Tough month for the East Bay: the Raiders have a QB but they’re not going anywhere this season and the A’s once again were dispatched in the divisional round. Advocates for restoring the Los Angeles River are asking DTLA residents to help petition the U.S. Army Corps of Engineers to select a $1-billion restoration plan that would create 719 acres of new parkland, marshes and wetlands and remove some of the river’s ubiquitous concrete. The story earns space here because a healthy river is good for downtown and a dense, well-rounded and robust downtown is good for transit. Today’s timewasters after the jump. 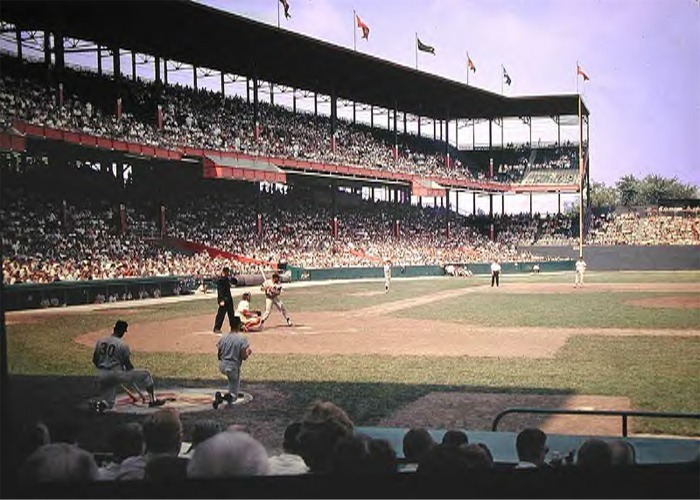 Check it out: Sportsman’s Park, the ballpark where the Cardinals played until the end of the ’65 season. Source: Wikipedia. Oh and here’s a good site with photos of dear, departed ballparks across the country. Having a rough day? Perhaps this will pick you up.